Victoria Beckham is due to be in LA today to sign the contract on the Beckham's new family home in Beverly Hills. The couple have settled for a multi-million dollar mansion which is big but not huge. It has been described as "modern, airy, very light and spacious with lots of windows." I know they won't but I would love them to do an MTV cribs. 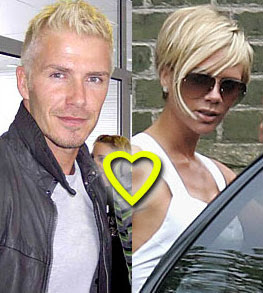 Here are some more photos of David with his new peroxide blonde do. I must admit, already it is growing on me. It looks better in these professional photos. The Real Madrid sports director, Pedja Mijatovic, has admitted that it was a mistake for the club not to renew David Beckham’s contract. 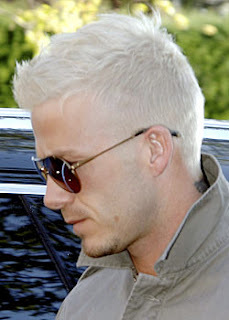 He made the admission to the Sun newspaper, saying that with hindsight it had been a mistake to allow Beckham to leave for the United States. He said that Beckham and his agent were confused by the statements both from him and the club President, Ramón Calderón. He now wants Becks to leave with the league title under his arm, adding it would be a shame for him to win nothing after four years at Real. Too little too friggin late. Had they conducted themselved properly and not made those stupid comments publicly David would not be going to the US to waste his talents. David and Victoria are scheduled to complete a photo session with top fashion photographer Stephen Klein for America's fashion bible W.
Its aim is to introduce the Beckham's to the US just before they move. It has been a while since they posed together for a magazine shoot. 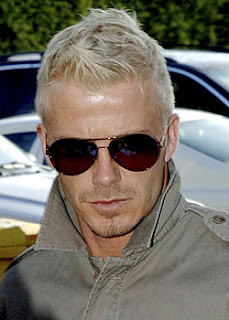 David Beckham today showed off his new blonder hair. Me no likey, sorry, the blonde is TOO blonde. He now looks very much like his wife, which is cute. No doubt it will grow on me...eventually. David Beckham made a public service announcement on American Idol last night for part of AI's 'Idol Gives Back' Campaign. The announcement was for the Malaria No More web site. The organization is set on ending deaths due to malaria. Los Angeles Galaxy have already made their money back on David Beckham, according to their owners. Beckham signed for Galaxy in January, although he does not actually move to America until July - once his commitments with current club Real Madrid have ended. However, endorsements and sponsorship deals done on the back of Beckham's arrival - mean his £10million five-year deal is already covered. The deals done include an additional 7,000 season tickets sold and a new multi-million sponsorship deal. Tim Leiweke, chief executive officer of the Anschutz Entertainment Group, the company who own Galaxy, has confirmed that the cost of Beckham's signing has already been met. "We were never worried about our financial commitment. We've already made our money back," he confirmed. Lucky them. And there was me thinking they were buying him because of his talent. Silly me. No wonder Camilla Shadbolt gets paid £4k a month to look like Victoria Beckham, she is the spitting image of her...twins if you like. For eight years the Camilla, who is 25-year-old, has copied every style statement and haircut change, spending £3,000 a year on clothes alone. Camilla said "During the last eight years, I've followed every one of Victoria's looks, except for the brown bob, when I wore a wig instead of going for the chop." And, unfortunately, Camilla is not too keen on the current blonde crop. "I liked the Pob - the Posh bob with the long strands at the front - but this style now is a bit too short." Luckily she is a petite size eight and has not had to resort to a gruelling diet and exercise regime to keep superslim. But she refuses to slim down to Posh's teeny size six and 7st 6lbs. Camilla like the rest of us has to make do with high street alternatives, rather than designer clothes. A DAY IN CAMILLA'S LOOKALIFE..
8AM: Get up, put Posh together. Victoria's latest crop is low maintenance, thankfully. Have to choose from 100 pairs of shoes. 10AM: To London for a photo shoot. Could be a magazine or posing for spoof pictures for lookalike photographer Alison Jackson. 4PM: Shopping, Posh's favourite sport. 6PM: Glam up for red-carpet event with Becksalike Andy Harmer . 11PM: Exfoliate, tan, goodnight Mrs Posh. Well 4 out of 5 ain't bad. Some more pictures of the happy event. Looks like she will have mummy's red hair. Emma is starting to show, how cute. Mel C could have made more of an effort. Victoria Beckham obviously took her role as God Mother very seriously yesterday as she got her hair did for the big occassion. Yesterday I noted how Vicky looked blonder, so I mocked up this comparison to show how much blonder she has gone. Here is Victoria arriving at a church in Hampstead for Geri Halliwell's daughter's christening. It's not the best picture, but Posh looks amazing in this white dress. It looks like she has had her hair done, it seems lighter than the pictures of her shopping yesterday. No Becks as he was playing for Real Madrid yesterday. Here are some more pictures from the christening. Romeo is just adorable in the first photo in his snazzy suit. My only criticism is that I wish Victoria had not worn the sunglasses. David Beckham returned from a six-week injury absence to set up Real Madrid's winner in a 2-1 victory over Primera Liga title rivals Valencia at the Bernabeu on today. Ruud van Nistelrooy scored with a spectacular volley to put Real in front before Fernando Morientes levelled against his former club soon after the break. David was on the subs bench, but came on in the 63rd minute replacing team mate Gonzalo Higuain. David provided a trademark free kick for Sergio Ramos to head the deciding goal in the 73rd minute. I hope David stays fit and Steve McLaren picks him for the England vs. Brazil game on 1st June. Here is David looking very cute celebrating the second goal. UPDATED- As requested here are some other and larger pictures of Becks from last nights game. Victoria Beckham was in London for the christening of Geri Halliwell's daughter, Bluebell Madonna. While in the capital Victoria did what she did does best....SHOPPING. Gordon Ramsey's wife Tanya joined Victoria for some retail therapy after they had lunch at the exclusive Cipriani restaurant. Burberry's in Notting Hill was the first stop, before they headed to Solange Azagury-Partidge boutique in Notting Hill boutique and ending the shopping trip in Sloane Street before heading back home. The police were called in Notting Hill to deal with the crowds Victoria was creating. I love that my girl can still pull a crowd. Victoria is carrying her trusty Jimmy Choo clutch which she was first spotting carrying in March, when accompanying David to the UK for his Football Academy Website Launch. Victoria Beckham is always on trend and she is wearing these Ksubi Skinny Zipper Jean in Royal Blue. You can get a cheaper pair from TopShop. Victoria wore this Valentino tutu dress leaving the Hassler Hotel in Rome to attend Tom and Katie's pre-wedding dinner. Geri Halliwell has asked Vic to be the God Mother to her baby girl Bluebell Madonna. The God Father will be George Michael's boyfriend Kenny Goss. Little Bluebell Madonna will be christened this weekend in a private ceremony in Hampstead, London. Vic and her boys are flying in from Madrid to be there. A source told The Sun: "Victoria was thrilled to be asked to be godmother. Although they fell out when Geri walked out on the Spice Girls years ago, they became really close again. Geri's relied on her old friend for advice on motherhood and is delighted Victoria is flying over." Geri has also invited the rest of the Spices - Mel C and Emma Bunton... only Mel B will be missing as she's still in LA after having her baby girl. The Times newspaper put together a UK Rich List every year. In the sports world, David Beckham cemented his position as Britain’s richest footballer, increasing his wealth by £25 million to £112 million. His lucrative transfer to LA Galaxy this summer is likely to see him increase his wealth further this year. 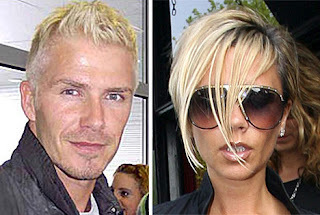 That is £9,166.66 per hour it cost for David and Victoria Beckham to spend some quality time alone in Paris. After arriving in Paris at about 4pm yesterday, the pair went shopping, looking at jewellery, cameras and - obviously - clothes. They reportedly spent £70,000 at several shops in the trendy Marais district. 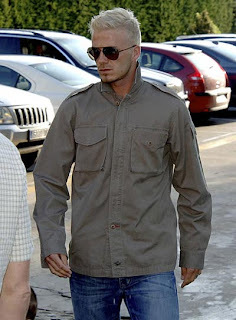 David Beckham had spent weeks organising private sessions at the showrooms of designers including Christian Louboutin, where Posh snapped up a pair of made-to-measure heels for £1,500. He then took her to one of her favourites, Azzedine Alaia to select a £7,000 dress. Their suite at the Ritz, and hiring the renowned Guy Savoy restaurant so they could dine alone would have set Beckham back another £15,000. All this makes me love David Beckham even more....isn't he just the best husband a girl could have? The trip to Chrisitan Louboutin would have been enough for me, but he went that extra mile to make his wife's day extra special. Victoria had only been expecting lunch in Madrid, but instead he drove her to the airport where he had spent £25,000 on a private jet. After dinner the couple retired to their suite at 1am - but they were back at Paris's Bourget airport at 4am for the flight back to Madrid. What did they do for 3 hours I wonder??? After a day shopping, David and Victoria spent the evening enjoying a romantic birthday dinner at Guy Savoy. David looked Extremely handsome - as always - in a 3 piece grey suit. Victoria wore a black babydoll mini dress, red YSL tribute pumps and tights. I hate tights so this outfit for me is ruined. I am surprised that Victoria even wore tights. This is the woman who had skin exposed on a skiing trip. I am also not crazy about the red lips. Victoria Beckham Dancing With The Stars?